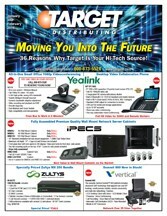 36 Reasons Why Target's Your Hi-Tech Source! Target Distributing carries the latest and greatest communication products that will help your business grow today and into the future. With over 40 years of experience in the communications marketplace we're the source resellers turn to for the products their customers need. Click Here for 36 Reasons Why Target is Your Hi-Tech Source!